2014 was the biggest year for the Wii U yet as it saw the release of several blockbusters including Super Smash Bros. and Mario Kart 8. In 2015, we have even bigger franchises coming to the Wii U and 3DS including the next Star Fox and Legend of Zelda. 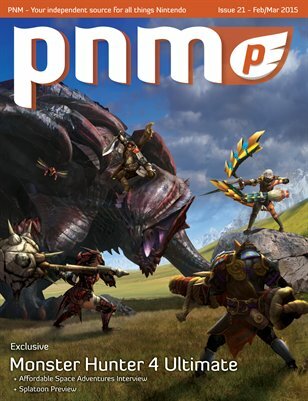 In this issue, we start off with all the latest information on Monster Hunter 4 Ultimate from our interview with the game’s producer, Ryozo Tsujimoto. We also talked with the folks at Knapnok Games about their upcoming collaboration with Nifflas’ Games entitled ‘Affordable Space Adventures’. If that wasn’t enough, we also have a huge preview for Splatoon, one of our most anticipated new franchises in 2015. With Monster Hunter 4 Ultimate, Splatoon, Star Fox, and the new Zelda all scheduled for 2015, it’s going to be a big year for Nintendo fans. Happy Gaming!